Amanda Y. Su Alan Hark uses a bevel-rubbing push cut to shape a student's Bigleaf maple bowl. When we enter the Mather House Woodturning Studio on a Friday evening, Jack B. Smith ’19 accosts us with a small slab of Hawthorn wood. Smith has been a regular at this studio since his freshman year. Hidden in the basement of Mather, the studio provides a space for students to practice the art of woodturning. Here, budding woodturners use hand tools and a lathe, a machine that rotates wood, to carve round items such as bowls, cups, tool handles, and candlesticks. The wood that Smith holds came straight from the limb of a Hawthorn tree in the Adams House courtyard, which snapped after a snow storm. Hark is a master woodturner. He has been teaching his craft in the Mather basement for the past 15 years, and working with wood for almost 50, having begun his career as a logger in Vermont. He continues to live there, commuting to Cambridge each weekend to teach. Decades ago, Hark became ill and was unable to continue logging, transitioning into health care advocacy instead. Seeking a hobby that would allow him to continue with his passion for working with wood, he began woodturning in the early 1980s. When he started turning, he says, there was no “real formal instruction” available. Using the only book available on the market at the time and a trial-and-error process, Hark refined his craft over the subsequent decades. “What I found was that the ‘centering’ effect of turning was beneficial to my emotional and intellectual balancing, thus offering a greater sense of wellbeing,” he says. He eventually retired from his advocacy job in 1998 and began pursuing woodturning professionally. Hark ended up in Boston because, as he says, “there was a lady that I was pursuing” who lived a couple blocks away from Harvard’s campus. For several years, he maintained a high-end gallery trade up and down the East Coast and produced custom work for collectors and museums. He performed woodturning demonstrations in the Porter Square store Rockler Woodworking and Hardware to drum up some attention for the craft. These demonstrations eventually led to a job teaching woodturning through the Cambridge Center for Adult Education at Rockler, where Hark continues to teach on weekends. In the spring of 2003, one of Hark’s adult education students, Aaron S. Allen, a Mather resident tutor, approached Hark after class and asked him if he would be interested in teaching a class at Harvard. After Hark agreed, he and Allen conducted what Hark calls a “midnight raid” of the Radcliffe Quadrangle, where they recovered an old, unused lathe sitting in a basement. That lathe, an addition to Hark’s own, was the first lathe of the Harvard woodturning program. Hark’s first formal classes at Harvard began in the spring of 2004. Since then, the program has seen the tenure of three University presidents. “There's one other person that's been here at the house longer than me, and that's Miguel [Casillas, Mather’s Building Manager],” Hark says. Hark currently teaches a beginner woodturning course on Friday afternoons, followed by courses for experienced turners on Friday evenings and Saturday afternoons. The program is open to all Harvard affiliates. Smith began turning wood in high school by looking at Instagram posts and watching YouTube videos. Arriving at Harvard with “minimal experience,” he read an old Crimson article about the woodshop in Mather’s basement and went down to meet Hark as a freshman. “He and I hit it off, and we've been close friends ever since,” he says. Now, before the Friday night returner classes, Smith and Hark usually catch up over dinner together in Mather dining hall. Last year, when Smith was working at Harvard’s Office for Sustainability, he found out that a favorite ornamental Japanese cherry tree was coming down outside of the Center for the Environment. Wasting no time, he retrieved a three-foot-tall chunk of wood from the wreckage before rushing to a meeting at the office. “I ended up rolling in with this piece of tree, which caught their attention,” Smith says. A few months later, when former University President Drew G. Faust announced her resignation, the Office for Sustainability commissioned Smith to turn a bowl in her honor. Smith decided to use the wood from that tree. Smith stained the outside of the bowl black, carving designs that resembled a traditional antebellum egg and dart crown molding pattern — a nod to Faust’s expertise in antebellum history. Despite the general lack of familiarity with woodturning, Smith notes its increasing popularity among those in his generation. 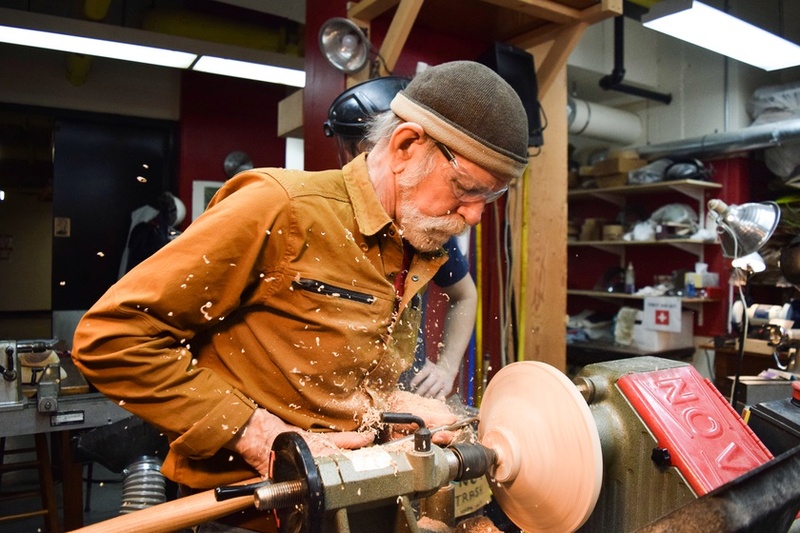 The opportunity to share the artform with younger generations and foster a greater appreciation for woodturning is what brings Hark down from Vermont every weekend. During class, Hark walks from student to student, giving pointers and sharpening their tools as needed. Smith stays in the corner, working on turning a bowl made of yellow birch wood that Hark has brought from Vermont. Mather House residents en route to basement laundry rooms peer into the studio, curious about the buzzing sound of the turning lathes. “Best kept secret of Harvard Arts,” Smith says.